The predominant vegetation throughout Europe and most temperate regions of the world was originally a varied forest with many different types of trees. Human beings have, since medieval times, gradually cleared the trees to make way for agricultural pastures and crops, mainly grasses and cereals bred from them. 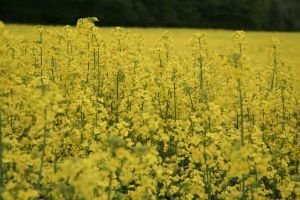 These are now the predominant greenery of the developed world and yield an unnaturally intensive harvest of grass pollens during the months of May, June and July. Your immune system can cope with almost anything in small doses as part of a seasonally variable cocktail, but finds large doses of just a few different varieties much more trying. Enough of any one thing eventually begins to irritate and can provoke you into allergy or an over-reaction very like it. Atopic people, who easily become allergic to things, are often allergic to grass pollen because there is so much of it. The proportion of people affected this way has never been high and is probably not rising. Meanwhile many others are becoming unable to tolerate the irritation produced by unnatural chemicals in their food, water and air. This perpetual nuisance gradually runs their immunity down and some of them eventually become over-sensitive even to natural substances if there is too much of them about — especially foods that are unnaturally plentiful throughout the year. Wheat is in this category, so that many people who are not strictly allergic only just manage to tolerate it without symptoms. A heavy seasonal barrage of closely related grass pollens finally breaks you down, with violent expulsive efforts in your nose, eyes and throat. Sneezing, congestion, itching, and copious watery discharge may lead to chronic inflammatory changes — a stubborn hard cough or even asthma. Unfortunately the hay fever season may never seem to end. Once your immune tolerance has broken, intensive effort may be needed to restore it. Otherwise your nose remains chronically irritable, provoked as easily by substances in your blood as by those you inhale. Unaccountable bouts of chronic rhinitis are the result, which you probably mistake for repeated colds. No virus infection lasts that long); start exploring why you should be so irritable. Otherwise your symptoms will get even more stubborn as your immune system loses its grip. 1. Try to identify exactly what you are reacting to, by the method described in Mansfield and Monro’s book ‘Chemical Children’ (Century 1987). 2. Honey: If your problem is still mainly seasonal, obtain nine pounds of honey collected from local hives just afterwards and eat a tablespoonful of it daily throughout the three months preceding your next hay fever season. This will acclimatize you to the pollens you have to tolerate then, and may enable you to do so without symptoms. The British Beekeepers’ Association can put you in touch with members in your area, but a local wholefood shop may stock their produce anyway — look for the characteristic label, overprinted with the bee-keeper’s name and address. 3. You cannot help what you breathe but have some control over what you eat. Throughout the hay fever season and for two months beforehand eat the diet for health leaving out all cereals to reduce your overall exposure to grasses. Do not then rely heavily on something else or you may break down your tolerance of that as well! Instead sample each food family for three consecutive days and then avoid it for the rest of the week, as detailed in ‘Chemical Children’. By rotating your menus in this way you can avoid symptoms and still eat a varied and interesting diet. 4. If necessary, supplement this diet for immunity. Lots of Vitamin C — 2000mg daily or more — is particularly helpful and inexpensive. 5. Keep fresh cultivated flowers in your home throughout the winter and breathe in their scent hard several times each day. Flowers are bred for their blooms at the expense of their pollen, so this habit keeps you accustomed to it by regularly inhaling small amounts. The pollen season therefore comes as less of a shock and you may cope without symptoms. 6. Allergic Rhinitis: Showering your face with cold water for several minutes helps control an attack of allergic rhinitis, if only for an hour or two. Homoeopathic Mixed Pollen (Weleda UK Ltd) abolishes the symptoms of about half the people that try it. If it fails at first try raising the potency. 7. Decongestants are less sedative than the antihistamines most doctors prescribe. Try not to use either for more than four days in each week, to retain their full effect and avoid dependence on them.